What Are the Benefits of a Raw Foods Diet? It seems like everywhere you turn, the term “raw” appears on popular food labels. Natural food stores are stocking their shelves with commercial raw vegan products from “raw protein bars” to “raw almond butter,” “raw sugar,” and even “raw chocolate.” By some estimates, the raw foods industry has experienced double-digit growth over the past couple of years, and there are no signs of slowing down. Can I really survive on just vegetables? Two of the very first questions curious minds may ask about a raw foods diet is, “What can I eat?” and “Can I really survive on just vegetables?” It is important to note that a healthy raw vegan diet consists of a wide variety of plant-based foods. This includes fresh vegetables, sprouts, nuts, seeds, grains, and fruits. These living foods are rich in antioxidants, vitamins, minerals, and plant-based proteins. They supply the oxygen, alkalinity, and bioelectrical charges vital for cellular health, detoxifying the body, and for overall well-being. The juicing benefits of wheatgrass, discovered by Ann Wigmore, have been popping up in many health facilities and institutes. These organizations are taking the raw foods diet a step further by incorporating wheatgrass as a central component of their living foods program, as well as using wheatgrass as a dietary supplement and healing tool. Wheatgrass is considered nature’s ”greatest healer” and is a complete food with an ideal alkaline-acid balance. Just one ounce of wheatgrass contains 103 vitamins, minerals, and amino acids. Wheatgrass is also a powerful detoxifier and cleanses the blood due to its high chlorophyll content (your liver; however, is you BEST detoxifier). It helps rid the body of heavy metals, pollutants, and other toxins that become stored in the body’s tissues and organs over the years. Those who are proponents will often drink daily shots of wheatgrass, taken on an empty stomach first thing in the morning, in addition to eating a rich raw vegan diet. Raw foods are prepared using cold-pressed oils and are heated or dehydrated at low temperatures, if at all. You may also find them made using organic oils such as olive, hemp, and raw sesame. Instead of vinegar – lemon, limes, and herbs may also be used. As a rule, for foods to be raw, they must be “cooked” at temperatures lower than 115 degrees. Our bodies need all the enzymes available in the food we eat, and heating food above 115 degrees destroys most of the plant’s nutrients and causes the food to be unrecognizable to our bodies. A living foods diet may provide enormous health benefits for those looking to improve their general health and for those who want to prevent premature aging or help reverse certain diseases. Living foods are so beneficial because they contain four essential elements that support the immune system: Hormones, oxygen, phytochemicals, and enzymes. By nourishing your body with these immune-boosting elements, instead of toxins and chemicals, people who adopt a proper raw vegan diet often experience increased vitality, energy, and mental clarity, to name just a few benefits. A living-foods diet may also help reverse some ailments and diseases. While the benefits of a raw foods diet are numerous, getting started can be overwhelming at first, so below are some tips for transitioning to a raw foods diet. No matter where you are on your health journey, everyone can begin with these easy steps: Follow them and your life may begin to transform. First Tip: Find a local juice bar where you can get a big dose of veggie nutrition (or purchase a juicer for home use). Juicing is the fastest and best way for the body to get all the essential vitamins and nutrients it needs. Within 20 minutes of drinking fresh vegetable juice, your body begins to absorb all the nutrients it just consumed, meaning you can start feeling better immediately. You may choose to sip on a gallon of green juice throughout the day or start with a shot a day (or half a shot a day) and work yourself up to four ounces each day. One signature drink that has shown promise for its health benefits is a green juice containing five ounces each of sunflower sprouts, pea sprouts, cucumber, and celery. If you visit the local juice bar, make sure to include that shot of wheatgrass. It provides the full range of vitamins and minerals and is also a complete source of protein. Second Tip: Stay away from freeze-dried and powered alternatives. Some research shows that wheatgrass supplements and freeze-dried powders are only two percent as efficient as fresh-juiced wheatgrass consumed within 15 minutes of juicing. The nutrients in wheatgrass begin to oxidize or break down, very quickly after that 15-minute period. Third Tip: Try and make at least one meal each day a big salad full of fresh vegetables. The benefits of eating fresh, unprocessed vegetables are many. Make sure to add plenty of green vegetables to your salad, as they are the foods most commonly missing in our modern diet. Greens are very high in calcium, magnesium, iron, potassium, phosphorous, zinc, as well as fiber, folic acid, chlorophyll, and other micronutrients and phytochemicals. Try experimenting with greens such as bok choy, kale, mustard greens, broccoli rabé, or dandelion root. If you are feeling particularly adventurous, you may also want to try adding sprouted lentils, sprouted broccoli rabé, or sprouted alfalfa to your salad. Sprouts contain a super concentration of natural enzymes that are easily digestible, making them up to 30 times more nutritious than even organic vegetables. Transitioning to a raw vegan diet can be challenging; the critical thing to remember is to take it slow. Try one thing at a time and continue to build on each success. Make it a combo! Combine food groups for a satisfying snack— low-fat yogurt and berries, apple with peanut butter, whole-grain crackers with turkey and avocado. Gesellschaft: Social relations based on impersonal ties, such as a duty to a society or organization (an example of society). The pros say it’s time to stop believing these misconceptions about healthy eating and weight loss. When it comes to hot-button topics, proper nutrition is near the top of the list. Regularly, Registered Dietitian Nutritionists (RDN’s) hear clients continuously tell them they’re fed up with hearing conflicting nutrition information and don’t know what to believe. Dietitians are with you on this one! Everyone seems to think they are a nutrition expert these days, which results in widespread nutrition confusion. 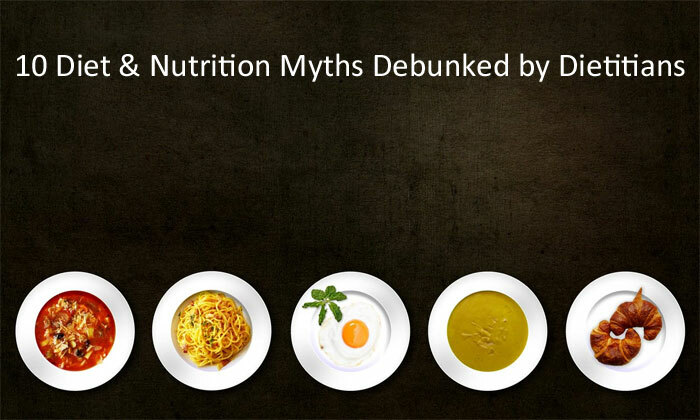 Here are the top 10 nutrition myths that dietitians cannot stand, and the truths they want you to know. Myth #1: Superfoods are exotic and expensive. This myth is a pet peeve for many RDN’s. While most dietitians love learning about nutrient-packed foods from around the world, they want people to know that local, everyday foods are superfoods, too, and are far less expensive! Eating a diet that’s high in processed foods but then adding in some goji berries and spirulina doesn’t mean you have a healthy diet. You’ll save money and be much more robust if you focus on eating more whole foods and “everyday superfoods” like spinach, mushrooms, squash, blueberries, oranges, apples, lentils, whole grains, and nuts. These familiar foods are packed with antioxidants and fiber and won’t blow your budget like that small bag of acai powder will. When a new exotic superfood comes on the market and becomes super popular, keep in mind that it’s probably just a fad. There will never be one food that’s better than all the others. Remember: Variety is essential when it comes to eating well. Ask yourself if spending money on the superfood of the moment is the best way to enhance your health, or if other parts of your diet could use a tune-up. Myth #2: Being slim means you’re healthy. This myth is a tough one to let go of because our society is so focused on body size. Everywhere we look, society seems to tell us that being slender is more desirable. Luckily, this myth is starting to dissolve. “We really have very little control over the size and shape of our bodies, and these things don’t determine our health,” says Kaleigh McMordie, RDN, of Lively Table. Research suggests that overweight people who are active can be healthier and live longer than slimmer people who don’t exercise. We all have different body types, and it’s about time we stopped focusing on size and shifted our focus to developing healthier habits. Dietitians want to see people choosing foods based on their nutritional benefits, not just thinking about calories. For example, having salmon on a salad is a more nutritious choice than having processed chicken breast strips loaded with artificial flavors, colors, and preservatives. Myth #3: Vegetarians and vegans don’t get enough protein. A well-planned vegetarian or vegan diet may also lower the risk of type 2 diabetes, high blood pressure, heart disease and some types of cancer. However, if you want to follow a vegetarian or vegan diet, it’s a great idea to meet with a dietitian to make sure you’re getting all of the nutrients you need. Myth #4: You should avoid all sugar—even fruit. If you want to cut back on sugar, it makes far more sense to limit added sugars instead of cutting nutrient-packed foods out of your diet. Food companies disguise added sugars under many different names so be cautious when at the grocery. (See Here are 56—yikes!—to recognize.) Clearly, fruit, vegetables, yogurt, and kefir are in a different category than soda and baked goods. The latter are high in added sugars and calories and low in nutrients. Myth #5: Soy is full of female hormones. Ginger Hultin, dietitian and spokesperson for the Academy of Nutrition and Dietetics, states, “Soy will not cause feminizing effects in men, it is safe and healthy for children to eat, and it does not cause or promote cancer. There is evidence that it is good for bone health and the cardiovascular system and it is a nutritionally dense, protein-rich food source.” It is best to choose whole soy foods like soybeans (edamame) and fermented soy such as tempeh and miso for gut health. These types of soy are the least processed and will be highest in nutrients. Myth #6: You need to ban carbs to lose weight. Swapping out refined grains like white bread for carbs that provide slow-burning energy, such as steel-cut oats, sweet potatoes, and quinoa is a healthy move, but banning all carbs from your diet is not necessary. At worst, it could lead to more carb cravings, and weight regains once you go off your low-carb plan. Myth #7: The diet that works for models and celebrities will work for you. Celebrities are usually chosen based on their good looks and slender body types, which are genetic gifts. Palmer notes, “People have tremendous genetic variability in body type and metabolism, making it very difficult for many people to achieve the magazines’ portrayal of what they consider beauty.” I like to remind myself and my clients that models and other celebrities have tons of help running their lives. That means they’re okay to spend a couple of days not functioning well thanks to a crash diet. You probably don’t have the same luxury, or a full-time doctor at your beck and call when things go wrong. 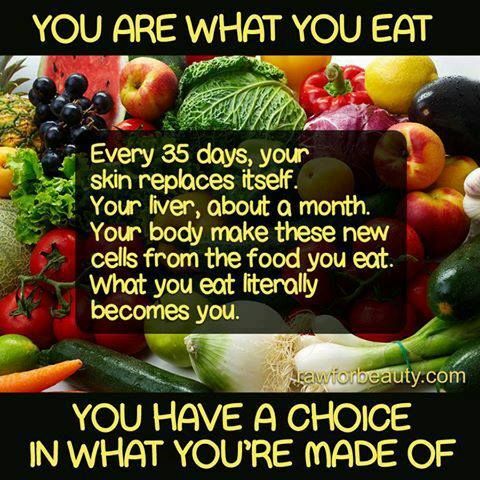 Not to mention the negative impacts on your health and metabolism over time. Get your nutrition and diet advice from people who are experts, not celebrities. Myth #8: Natural sugar isn’t sugar. Myth #9: High-fat foods are bad for you. Think eating fat makes you fat? Research suggests this is a myth. A lower calorie eating plan that includes healthy fats can help people lose more weight than a similar diet that’s low in fat, according to a study in the International Journal of Obesity. That’s because fat helps you enjoy your food more and prevents you from going hungry. Both of these are key to losing weight and keeping it off. “While fat definitely has more calories per gram than protein and carbs (9 calories per gram versus 4 calories per gram), it’s not the enemy,” assures Natalie Rizzo, RDN, a registered dietitian in New York City. “An observational study suggests that replacing 5% of your total calories from saturated fat with unsaturated fat actually decreases death rates by 27%. In other words, don’t be scared of the healthy fats found in foods like walnuts, olive oil, and avocados.” Include some healthy fats at each meal to help you feel satisfied and stay full longer. Add avocado to smoothies, wraps, oatmeal, and salads along with nuts and seeds. You can also use it in salad dressings combined with extra virgin olive oil. Myth #10: Mixing carbs with protein and fat is bad for digestion. The myth that mixing different types of foods is hard on our digestive system has been around for decades. Initially, it was referred to as “food combining,” and it’s now experiencing a resurgence as “the Dissociated Diet.” The idea is that you need to eat protein-rich foods such as eggs at one meal and carbohydrate-rich foods such as toast at another meal, but never together. “This myth makes no scientific sense because once food reaches your stomach, your stomach acid begins breaking down all types of food.,” says Lindsey Pine, RDN, owner of TastyBalance Nutrition. “In fact, it’s beneficial to mix carbs, protein, and fat in the same meal or snack because you’ll get a wide range of nutrients, avoid insulin spikes, and the protein and fat will help with satiety.” Could you imagine never having berries with your yogurt or cheese with crackers ever again? Your digestive system is designed to handle a variety of foods. Eat what you enjoy and what makes you feel good. Do not base your eating regimen on the latest fad diet! Create a work of art! Add color to salads with baby carrots, shredded red cabbage, or green beans. Include seasonal veggies for variety throughout the year. Approximately 1.4 million Canadians and 10 million Americans are living with osteoporosis, a condition characterized by low bone mass and deterioration of bone tissue. Now, scientific research has found that just eating a serving of five prunes a day may help slow and prevent bone loss. Research published in the journal Osteoporosis International studied postmenopausal women with low bone density, who ate 5 to 6 prunes (50g) per day, for a six-month period. The research suggests that this level of consumption was as effective in preventing bone loss as a previous study where postmenopausal women consumed 10 to 12 prunes (100g) per day for one year. “This research is extremely compelling since women can lose 1 to 1.5 percent of their bone density annually following menopause,” says Dr. Shirin Hooshmand, Ph.D. and lead researcher, of the study, at the School of Exercise and Nutritional Sciences at San Diego State University. In April 2017, a comprehensive review of 24 studies on prunes and bone health published in Nutrients. The author found that prunes enhanced bone formation and exerted beneficial effects on bone mineral density. The evidence continues to grow and support the fact that incorporating prunes as a regular part of a nutritious diet seems to offer long-term bone health benefits, particularly in postmenopausal women. A more extensive clinical trial is currently underway, to further explore prunes’ effect on bone density and estimated bone strength in postmenopausal women. Research continues to discover the potential mechanism and compounds in prunes that support healthy bones. In addition to supporting healthy bones, prunes also help promote heart and digestive health. 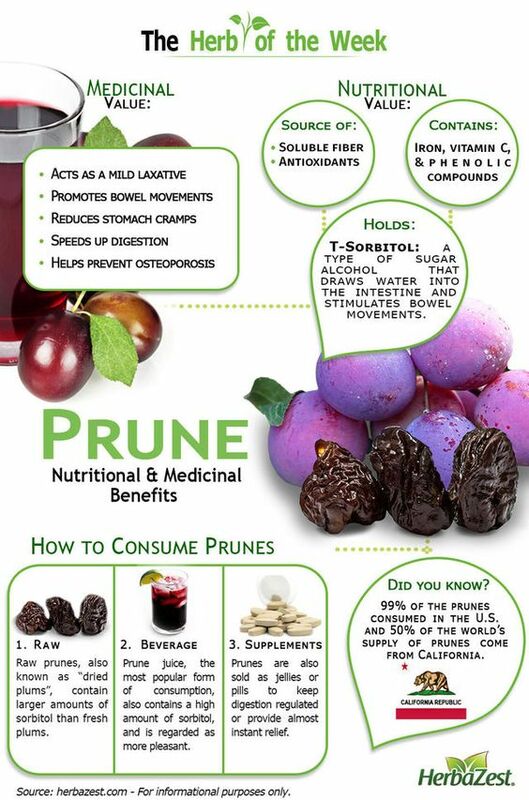 Prunes have a low glycemic index, which along with fiber, helps manage blood sugar levels. Stop Eating 2 Hours Before Bedtime! Eating fuels our body to be used as energy, which we don’t need right before going to sleep. While you’re sleeping, your body uses a natural sleeping metabolism to help you burn fat. Plus, not eating two hours before bed will help you cut out unnecessary calories! From Colombia to South Africa, France to India, governments around the globe are exploring whether taxes on sugar-sweetened beverages (SSB) might curb obesity rates. Do these fines actually work to prevent people from choosing sweet drinks? Adding a small fee to the price tag of SSB’s at one UK restaurant chain most likely contributed to a decline in their sales, according to a study (published Oct. 2017) in the Journal of Epidemiology & Community Health. Jamie’s Italian, a chain created by celebrity chef Jamie Oliver, launched its own health campaign in September 2015. Along with adding 10 pence (about 13 cents) per drink to SSB, the chain offered new lower-sugar beverages and redesigned its menus. After the fee was introduced, the chain observed an 11% decline in the number of sugar-sweetened beverages sold per customer during the first 12 weeks, according to the researchers. Over a six-month period, after the levy was charged, the number of sugary drinks had declined by 9.3% per customer. “Sugar taxes are currently prevalent policies to curb obesity rates and improve population diet,” said Steven Cummins, senior author of the study and a professor of population health at the London School of Hygiene & Tropical Medicine. “There’s actually very little evidence that they work in practice. There’s only a couple of studies that assess the impact of these kinds of (taxes) in real life on real customers.” Cummins and his colleagues analyzed Jamie’s Italian health campaign to add to this knowledge base. Drinking sugar-sweetened beverages, including non-diet sodas, flavored juices, and some sports drinks, is associated with obesity, type 2 diabetes, cardiovascular disease, and cavities. In the UK, sugar-sweetened drinks may account for half of the excess calories consumed per day by children (two-thirds by U.S. children) while one in four British adults (one in three U.S.) are obese, according to a 2013 report from the United Nations. The same report also found that obesity rates among adults have more than tripled in the past three decades. 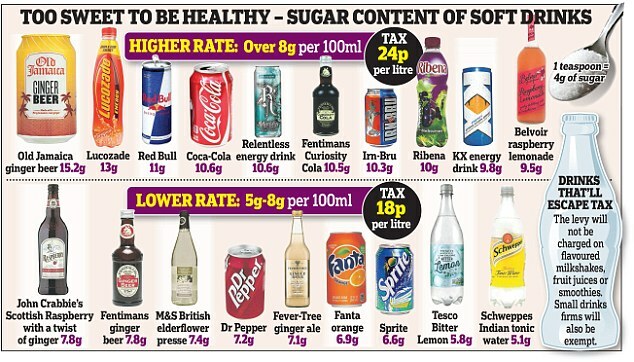 In 2015, the National Health Service made public its worries that the UK has become the “fat man of Europe.” Shortly after that, Jamie’s Italian decided, according to its website, to “raise awareness of how much sugar is present in certain soft drinks and make people think about their sugar intake, particularly that of their children” by adding 10 pence to the price tag. The price increase can be seen as a complex “intervention” including a financial element in combination with non-fiscal components, the researchers said. Analyzing sales data from before and after the intervention, Cummins and his colleagues calculated the average number of sugar-sweetened beverage sales per customer in 37 Jamie’s Italian restaurants. In the 12 months prior, a total of 2,058,581 non-alcoholic beverages were sold in the restaurants, and 38% (775,230) of them were sugar-sweetened drinks. Adding a 10-pence fee to SSB was associated with significant declines (11.04%) in sales per customer, with the highest reductions in restaurants with higher SSB sales per customer (18.77%), the results indicated. “A lot is going on here in this study,” said Jayson L. Lusk, a professor and head of the Department of Agricultural Economics at Purdue University, who did not participate in the research or the analysis. “It’s hard to conclude that the price change in sugar-sweetened beverages is the main cause of the changes being observed,” Lusk said, noting that bottled water and diet cola consumption fell at about the same rate as the increased-price sugary beverages after the intervention began. Meanwhile, the beverages introduced after the price increase introduce a “confound” into the experiment: an element that disrupts and adds confusion to the results. Overall, previous research on this topic suggests that such taxes will probably have small effects on consumption of taxed beverages and that people will merely substitute other high-calorie, non-taxed drinks and foods, Lusk said. So, can sugar-sweetened beverage taxes lower SSB consumption? “Yes, by a small amount,” he said. “But that’s different than saying sugar-sweetened beverage taxes reduce caloric intake. “There’s also literature showing these taxes tend to be regressive, affecting lower-income households more than higher-income households,” Lusk said. Jason M. Fletcher, a professor of public affairs and sociology at the University of Wisconsin-Madison, said some of the results from the new study suggest a “general weakness in the analysis.” Fletcher did not participate in the new study. After the intervention, there was a reduction in sales of all types of beverages compared with before the intervention, Fletcher noted, and the authors did not adequately estimate the effects of the 10-pence levy for each beverage in their analysis. “In our own work, we find support for substitution effects in the U.S., where higher taxes on soda lead to two effects: (1) less consumption of soda and (2) more consumption of other high-calorie drinks,” Fletcher said. “Combining these effects can lead to no increase in health.” Americans consume more than 40 gallons of sugary drinks per capita each year, on average. Eat Your Chocolate! Yes, you read that right! Having a small amount of dark chocolate – 70-85% cocoa – is rich in fiber, iron, and magnesium, among other minerals. Plus, it’s a great source of antioxidants which reduces free radicals in your body. Analects: A collection of short literary or philosophical extracts. Laboratory mice that are given the gut bacteria of wild mice can survive a deadly flu virus infection and fight colorectal cancer dramatically better than laboratory mice with their own gut bacteria; researchers report (October 19, 2017) in the journal Cell. The immunological benefits from the wild mice’s gut bacteria may, in part, explain a persistent problem in disease research: Why disease experiments in lab mice, such as vaccine studies, turn out very differently in humans or other animals. “We think that by restoring the natural ‘microbial identity’ of laboratory mice, we will improve the modeling of complex diseases of free-living mammals, which includes humans and their diseases,” said Barbara Rehermann, M.D., senior author of the paper. Rehermann is chief of the Immunology Section, Liver Diseases Branch, of the NIH’s National Institute of Diabetes and Digestive and Kidney Diseases (NIDDK). “By being so different, natural microbiota will help us to discover protective mechanisms that are relevant in the natural world and absent in the laboratory,” said Stephan Rosshart, M.D., first author of the paper and NIDDK postdoctoral fellow. Mammals, humans included, depend on their microbiota, the collection of microorganisms they host in and on their bodies. Evolution shapes each animal’s microbiota, favoring populations of organisms that help the animal survive their environment and diseases they encounter. However, laboratory mice are not random house mice plucked from a field or basement. Laboratory mice are carefully bred, fed, and raised in tightly controlled conditions so that each mouse has predictable traits and genetics. This is an excellent advantage in basic biology research, but creating that predictability means that a controlled environment, and not the survival pressures of the outside world, shaped the microbiotas of laboratory mice. “We hypothesized that this might explain why laboratory mice, while paramount for understanding basic biological phenomena are limited in their predictive utility for modeling complex diseases of humans and other free-living mammals,” said Rosshart. Therefore, the researchers tried to give laboratory mice back what they have lost: A naturally co-evolved wild mouse gut microbiota. The researchers trapped more than 800 wild mice from eight locations across Maryland and the District of Columbia to find healthy, suitable candidates for a gut microbiota donation. They then tested and compared the gut microbiomes (collective genomes of the gut microbiota) of the wild mice (Mus musculus domesticus) and a standard strain of laboratory mice, called C57BL/6, from multiple sources. The researchers confirmed that C57BL/6 mice had distinct gut microbiomes from wild mice. Researchers then introduced (engrafted) the microbiota of wild mice to pregnant, germ-free C57BL/6 mice. Germ-free mice are raised in a sterile environment and don’t have microbiomes of their own. For a control group comparison, the researchers also engrafted microbiota from regular C57BL/6 mice into a separate group of pregnant, germ-free mice. Four generations later, the mice still carried either the wild microbiomes or the control laboratory microbiomes passed down from their foremothers. When exposed to a high dose of influenza virus, 92 percent of the laboratory mice with wild microbiomes survived, whereas only 17 percent of laboratory mice and mice in the control group survived. In other experiments, the laboratory mice with wild microbiomes had better outcomes in the face of induced colorectal tumors, whereas the other mice had a higher number of tumors and more severe disease. The beneficial effects of the wild microbiota were associated with reduced inflammation in both models. The researchers note that more work and evaluation is needed for definitive results, and they hope to improve and expand upon the method of using natural microbiomes in laboratory mice. “We are planning to create a complete microbiological fingerprint of natural microbiota and its potential trans-kingdom interaction by describing all components of the microbiome — for example, viruses and fungi — in parallel and at various body sites,” Rehermann said. So, it’s ok not to be a germaphobe and let the little critters run free, every now and then! Use A Vegetable Substitute! Love spaghetti? Try spaghetti squash. Sure it’s not pasta but just try it, you may like it! Love mashed potatoes? Try mashed cauliflower (OMG it’s heavenly! You will never go back to potatoes). Mix in some Greek yogurt to give it a thick, creamy texture like regular mashed potatoes. While vegetables most likely won’t be the carbs you know and love, they’re a good way to make your favorite meals healthier! Before you say goodbye to ice cream and mozzarella, here’s what you should know. Thinking about eliminating milk, cheese, butter, and other dairy products from your diet (God help you; I could never give up cheese!)? You’re not alone. Whether or not to give up dairy, and how to do it is one of the top questions Cynthia Sass, MPH, RD, is often asked. One possible reason why so many people are ditching dairy? It’s gotten the A-list stamp of approval from those in the spotlight, from Jessica Biel who says she “just feels better” when she doesn’t eat dairy, gluten, or wheat to the Kardashian family where the women claimed that by going dairy-free they lost over 11 pounds in two weeks. And I have to be honest here and say, “Who Cares” but unfortunately these are some of the most “prized” role models. Many experts stress that quitting dairy is not something to be done spontaneously or without cause. “You don’t need to eliminate an entire food group unless there’s a legitimate reason,” says Keri Gans, RDN, a nutritionist based in New York City. That said, if you do decide to give up dairy, there are five side effects you might experience. Before you swap out your 1% for almond milk, it’s important to remember that dairy products can be part of a healthy diet. After all, there’s a reason why the USDA recommends adults have three cups of dairy per day; milk, cheese, and yogurt are rich sources of vitamin D, protein, and calcium, a critical nutrient for bone health. “It’s important to know how to replace them [if you give up dairy],” Sass says. If you’ve decided to eliminate dairy, work with a dietitian nutritionist (RDN) to create a diet plan that still includes plenty of these nutrients. “It’s not to say that someone who gives up dairy can’t get enough vitamin D and calcium, but it’s not as easy,” says Gans. Dark leafy veggies, such as kale and collard greens, and fatty fish like sardines and canned salmon are good non-dairy calcium sources. Certain brands of plant-based milk and orange juice are also fortified with calcium and vitamin D, Sass notes, although “they’re low in protein so you may need to bump up your intake of foods like eggs, pulses, or salmon to maintain your total protein intake.” If you’ve eliminated dairy and are having trouble finding calcium and vitamin D alternatives that you enjoy, meet with an RDN to discuss whether or not you should start taking a supplement. Wanting to lose weight is often cited as the main motivation to cut out dairy, and Sass acknowledges that doing so may help you shed pounds. “I have had clients reduce body fat after giving up dairy,” she says. An important caveat, though: Weight loss after eliminating dairy “is often due to how they consumed it [before], how much, and in what form,” Sass explains. If pizza, mac and cheese, and grilled cheese sandwiches were your go-to meals, and you replaced them with lean proteins, whole grains, and fresh produce, then yes, you’d probably see the numbers on the scale drop. “It’s not dairy itself, it’s the way it’s being consumed,” says Gans. In fact, research suggests that full-fat dairy, in particular, may actually aid weight loss. In an extensive 2016 study in the American Journal of Nutrition, researchers found that women who consumed higher quantities of high-fat dairy products had an 8% lower risk of being overweight or obese. One possible explanation: Full-fat dairy contains more calories, which may keep you feeling satiated for longer, and less likely to reach for known weight-gain culprits like sugar and refined carbs. “When people inquire about giving up dairy, it’s usually because they’re feeling bloated,” says Gans, adding that the culprit is almost always lactose intolerance. People with this condition can experience bloating and gas, plus severe stomach pain, diarrhea, and cramps when they consume dairy products. The reason: Lactose intolerant folks do not produce enough lactase, an enzyme that’s important for breaking down a type of sugar called lactase found in milk products. However, “not everybody with lactose intolerance needs to 100% remove dairy from their diet,” Gans says. Cutting back on your overall intake, or consuming dairy products along with other foods (such as cereal with milk instead of ice cream by itself) may be enough to ease symptoms. If you have a condition that damages the digestive tract, such as Crohn’s disease or celiac disease, you may also get relief from inflammatory bowel disease (IBD)–like symptoms when you cut back on dairy. Some may swear that going dairy-free helps the fight blemishes, but the relationship between diet and acne is an ongoing source of debate among dermatologists. Research stretching back to the 1940s suggests at most a weak link between dairy consumption and breakouts. However, some experts believe the hormones in milk products could play a role in exacerbating hormonal acne, and many people do report clearer complexions when they give up these foods. The American Academy of Dermatology recommends noting any food triggers that seem to aggravate the skin and cutting back with the help of an RDN to make sure you’re still eating a balanced diet. There’s no scientific evidence to back up claims that dairy aggravates skin conditions. That said, some people with eczema and psoriasis report fewer symptoms after they cut back or entirely eliminate dairy. In general, when skin is acting up, an RDN may recommend an elimination diet to help pinpoint the offender. Dairy is considered one of the most common food allergens (along with wheat, eggs, soy, fish, shellfish, tree nuts, and peanuts), and is usually one of the groups excluded in such a diet. After a few weeks, food groups are added back to see which one is triggering inflammation. The bottom line: Cutting out dairy is not a guaranteed fix for those with psoriasis and eczema. However, if you’re experiencing a sudden flare of symptoms, it may be worth trying an elimination diet to find out if a particular food is to blame; However, consult an RDN before attempting this diet. Drink Warm Lemon Water! Drinking a glass of warm lemon water in the morning will start your day off right! You’ll get a boost of vitamin C, clean out toxins from your body and keep your digestion system on track. Researchers have found that inducing a biochemical alteration in brain proteins via the dietary supplement glucosamine was able to rapidly dampen that pathological hyperexcitability in rat and mouse models. These results represent a potentially novel therapeutic target for the treatment of seizure disorders, and they show the need to better understand the physiology underlying these neural and brain circuit changes. Seizure disorders, including epilepsy, are associated with pathological hyperexcitability in brain neurons. Unfortunately, there are limited available treatments that can prevent this hyperexcitability. However, the *University of Alabama at Birmingham researchers have found that inducing a biochemical alteration in brain proteins via the dietary supplement glucosamine was able to rapidly dampen that pathological hyperexcitability in rat and mouse models. These results represent a potentially novel therapeutic target for the treatment of seizure disorders, and they show the need to better understand the physiology underlying these neural and brain circuit changes. Proteins are the workhorses of living cells, and their activities are tightly and rapidly regulated in responses to changing conditions. Adding or removing a phosphoryl group of proteins is a well-known regulator of many proteins, and it is estimated that human proteins may have as many as 230,000 sites for phosphorylation. A lesser-known regulation comes from the addition or removal of N-acetylglucosamine to proteins, which is usually controlled by glucose, the primary fuel for neurons. Several years ago, neuroscientist Lori McMahon, Ph.D., professor of cell, developmental and integrative biology at UAB, found out from her colleague John Chatham, D.Phil., a UAB professor of pathology and a cardiac physiologist, that brain cells had the second-highest amounts of proteins with N-acetylglucosamine, or O-GlcNAcylation, in the body. At the time, very little was known about how O-GlcNAcylation might affect brain function, so McMahon and Chatham started working together. In 2014, McMahon and Chatham, in a study led by graduate student Erica Taylor and colleagues, reported that acute increases in protein O-GlcNAcylation caused long-term synaptic depression, a reduction in neuronal synaptic strength, in the hippocampus of the brain. This was the first time acute changes in O-GlcNAcylation of neuronal proteins were shown to directly change synaptic function. Since neural excitability in the hippocampus is a crucial feature of seizures and epilepsy, they hypothesized that acutely increasing protein O-GlcNAcylation might dampen the pathological hyperexcitability associated with these brain disorders. That turned out to be the case, as reported in the Journal of Neuroscience study, “Acute increases in protein O-GlcNAcylation dampen epileptiform activity in the hippocampus.” The study was led by corresponding author McMahon and first author Luke Stewart, a doctoral student in the Neuroscience Theme of the Graduate Biomedical Sciences Program. Stewart is co-mentored by McMahon and Chatham. “Our findings support the conclusion that protein O-GlcNAcylation is a regulator of neuronal excitability, and it represents a promising target for further research on seizure disorder therapeutics,” they wrote in their research significance statement. The researchers caution that the mechanism underlying the dampening is likely to be complicated. Glucose, the primary fuel for neurons, also controls the levels of protein O-GlcNAcylation on proteins. However, high levels of the dietary supplement glucosamine, or an inhibitor of the enzyme that removes O-GlcNAcylation, leads to rapid increases in O-GlcNAc levels. In experiments with hippocampal brain slices treated to induce stable and ongoing hyperexcitability, UAB researchers found that an acute rise in protein O-GlcNAcylation significantly decreased the sudden bursts of electrical activity known as epileptiform activity in area CA1 of the hippocampus. An increased protein O-GlcNAcylation in normal cells also protected against a later induction of drug-induced hyperexcitability. The effects were seen in slices treated with both glucosamine and an inhibitor of the enzyme that removes O-GlcNAc groups. They also found that treatment with glucosamine alone for as short a time as 10 minutes was able to dampen ongoing drug-induced hyperexcitability. In common with the long-term synaptic depression provoked by increased O-GlcNAcylation, the dampening of hyperexcitability required the GluA2 subunit of the AMPA receptor, which is a glutamate-gated ion channel responsible for fast synaptic transmission in the brain. This finding suggested a conserved mechanism for the two changes provoked by increased O-GlcNAcylation — synaptic depression and dampening of hyperexcitability. The researchers also found that the spontaneous firing of pyramidal neurons in another region of hippocampus, area CA3, was reduced by increased O-GlcNAcylation in normal brain slices and in slices with drug-induced hyperexcitability. This reduction in spontaneous firing of CA3 pyramidal neurons likely contributes to decreased hyperexcitability in area CA1 since the CA3 neurons directly excite those in CA1. Similar to the findings for brain slices, mice that were treated to increase O-GlcNAcylation before getting drug-induced hyperexcitability had fewer of the brain activity spikes associated with epilepsy that are called interictal spikes. Several drug-induced hyperexcitable mice had convulsive seizures during the experiments, this occurred in both the increased O-GlcNAcylation mice and the control mice. 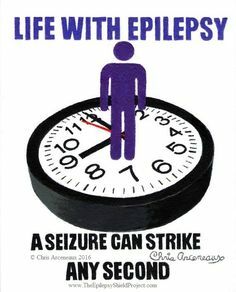 Brain activity during the seizures differed between these two groups: The peak power of the brain activity for the mice with increased O-GlcNAcylation occurred at a lower frequency, as compared with the control mice. *I am very proud to say UA (though UA Tuscaloosa) is my graduate program home! Nutrition Daily Nugget…..and a bit of wine! Watch out for added sugars! They add extra calories but no helpful nutrients. Sugar-sweetened beverages and soft drinks are the number one source of added sugars for most of us. AND….if you are looking for some excellent wine selections, check out Bright Cellars. The link is also on the right side of my blog for future reference.